Whether it’s slow-roasted, tender brisket seasoned with a blend of 17 spices, or simply a side of house-made cocktail sauce with shaved ginger and jalapeños, executive chef Michael Soltes taste-tests every ingredient in his Nashville kitchen. It’s a habit built from years behind the stove at fine dining restaurants and luxury hotels, notably training under Spanish-American celebrity restaurateur José Andrés -- the man credited with bringing tapas to the US. Now, Soltes’ days start at 5:30am, scribbling prep lists in the welcome stillness of the kitchen. The pre-dawn ritual gets his mind ready to lead an 82-person crew of executive sous chefs, kitchen managers, and cooks, who will feverishly prepare and assemble dishes for 18 straight hours. Everyone needs to be on their toes before the roar of guests flood the kitchen with requests for more roasted garlic hummus appetizers, extra sides of house-roasted tomatillo salsa, or another plate of air-fried wings dry-rubbed with a signature 24-hour citrus brine. Welcome to the delicious, passionate scene of Soltes’ kitchen -- located in just one of Topgolf’s 38 locations (and counting) across the country. Topgolf was born in the United Kingdom in 2000, created by twin brothers who wanted to make golfing more tech-forward, fun, and engaging. Its microchipped golf balls, interactive target competitions, and climate-controlled hitting bays mean you don’t have to be a golf pro to enjoy the experience -- and food is a big part of that. 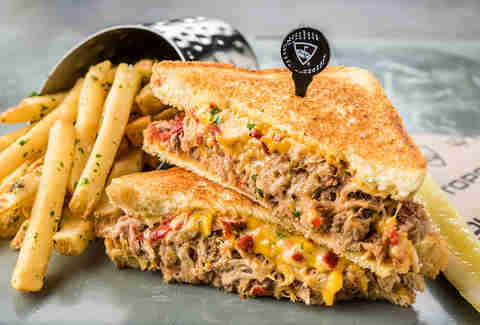 As Topgolf has expanded to 19 US states (with locations opening soon in nine additional states, as well as faraway destinations like Australia and Dubai), the venues now attract 13 million guests annually, who come not just for the next-gen golf games, but what’s grown to be a deliciously inventive menu. Unlike the sad pizza slices you’d find at a bowling alley or those standard bar buffalo wings, Topgolf’s chef-inspired menu is no afterthought. 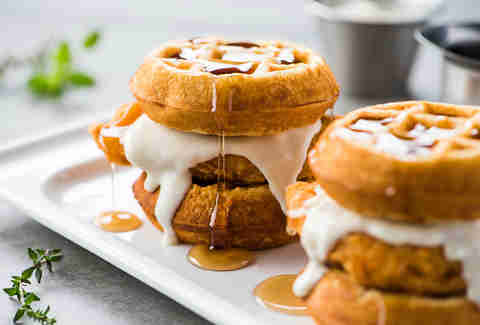 Here, sliders consist of crispy chicken tenders sandwiched between two miniature Belgian waffles and drizzled with maple syrup and jalapeño gravy. That basic meat & cheese plate? It’s been upgraded, stuffing charcuterie, fruit, and dipping sauce into each divot of a 10-inch jumbo pretzel. Flipping through the extensive menu is almost enough to put you in a food coma on the spot. 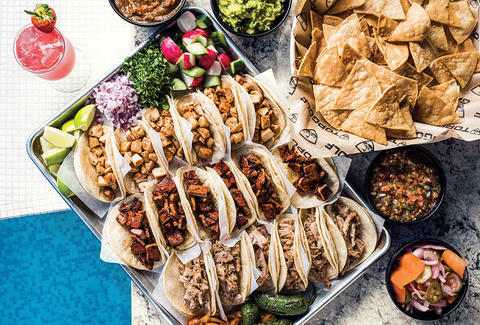 In a nod to regional tastes, Topgolf’s Nashville and Las Vegas venues both have locally-flavored dishes on their menus. Delgado developed Nashville's menu after taking a research food tour of the city, visiting 17 restaurants in 32 hours. The resulting chicken biscuit, pork ’n’ pimiento, and hot chicken sandwiches deliver Southern flavor for guests taking a break from dancing at The Cowan, Topgolf's 600-capacity live performance venue (this is Music City, after all). At the Vegas location (poolside cabanas included), executive chef Chris Vaughn -- whose resume includes opening several swanky restaurants at The Cosmopolitan hotel -- oversees an almost completely unique menu, where dishes like ahi tuna and crab poke bowls, bao-bun short rib tacos, and al pastor pork sticks compete with any of the Strip’s other fine-dining options. But no matter where you’re teeing off, every Topgolf venue has its own culinary-trained executive chef to oversee its menu of elevated American fare. “We want to wow people by what we do with our take on familiar favorites with a twist,” Delgado says. 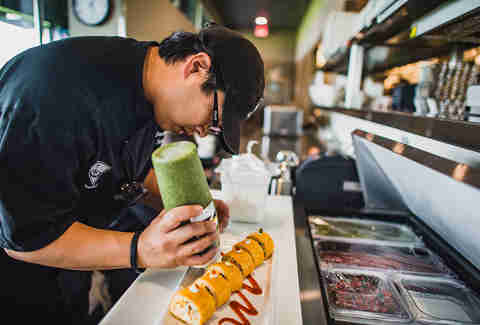 Case in point: Their exclusive “Mushi,” a Mexican-sushi mashup with cilantro sticky rice, drunken beans, and spiced chicken wrapped in a jalapeño tortilla, which is available at every location. In a food landscape where diners favor organic, farm-to-table, and locally-sourced, so does Topgolf. “Guests are pretty surprised by how fresh our food is, and the majority of it is prepared from scratch daily,” Delgado adds. Venues receive product deliveries six days a week to ensure the freshest ingredients. Pecans are candied in-house for spinach salads with cinnamon-chili goat cheese. The majority of the sauces, salsas, and dips on the menu are made from scratch three times a day. That hollandaise sauce for the savory eggs Benedict (there’s a full breakfast and brunch menu) doesn’t come out of a jar -- it’s a Topgolf recipe. Every burger is made from their own proprietary blend of Angus ground chuck, short rib, and brisket. Chefs smoke all the meat right in the kitchen for dishes like pulled pork sliders and barbecue brisket grilled cheese. Even the cooking stocks used as bases are made in-house. Not everything on the menu is a calorie bomb, either. To capitalize on seasonal ingredients, Topgolf devotes a section to dishes that rotate throughout the year; for spring, there are lighter, healthier options such as a watermelon salad with arugula and feta that’s under 300 calories. The seasonal section also includes one recipe straight from a lucky member of the Topgolf kitchen… with the blessing of a celebrity chef, no less. “Welcome to the finals. What are you guys making over there?” asks Scott Conant while four chefs scramble to put together a dish worthy of winning the famous restaurateur’s (formerly of NYC’s Scarpetta) vote in the face-off. The challenge? Create a one-of-a-kind spring meatball platter with an accompanying sauce using only the ingredients provided. Oh, and do it in 45 minutes. It's more than just bragging rights on the line, though. The finale’s winning dish earns a coveted seasonal spot on Topgolf’s national menu. This year, Virginia Beach sous chef Cat Colaizzi won the top prize for her Mediterranean twist on traditional meatballs: chicken and lamb meatballs on a bed of arugula, carrots, and pickled onions with a honey-balsamic vinaigrette and tzatziki sauce -- now available to order at any Topgolf venue. Here, corporate training is also way more than food safety checks and team bonding exercises. Each year, every executive chef across the country heads to a three-day Topgolf Chef Summit, including two days of “mystery basket” cooking challenges where chefs can flex their culinary creativity. “The night before, in Buffalo, I got to try… beef on a weck, so I knew I wanted to do my own version of that for this challenge,” says Vaughn, the Vegas executive chef. He took the flatbread in his basket and transformed it, seasoning it with “everything bagel” spices and topping it with Danish blue cheese, marinated cherry tomatoes, arugula, slices of rare tenderloin, and a light drizzle of horseradish, lemon juice, and olive oil. While you won’t find his creation on the Topgolf menu, that inventive spirit fuels every kitchen. Pop by your local Topgolf, and you might even be able to give your compliments to the chef in person. Both Soltes and Vaughn say that they like to sneak away from the kitchen when they can to personally deliver dishes to guests so they can answer questions about how a sauce was made or what ingredients are in the signature nachos. If there’s one common thread that runs through a menu whose size puts an East Coast diner’s to shame, it’s that every dish is designed as a “shareable” item. Perhaps that’s why non-golfers make up over half of Topgolf’s guests -- the true sport here is socializing. And if you want happy customers, it never hurts to keep them well fed.